I spent about an hour this morning cleaning emails off the server. OK, it's my own fault. I tend to save too much stuff thinking I'll come back to it over and over again. The emails saved for business are the CYA variety. "Evidence", if you will, in that never ending what if a mistake was made on an order. I also spend in an inordinate amount of time "unsubcribing" to unsolicited mail. It's woefully obvious that too many folks send/receive too much information. I suppose I should go to my RSS feed as well. I tend to accumulate stuff there as well. The saving grace is that I only follow a few feeds. Can you imagine, given all of the blogs out there? And now the push is on to embrace/engage with Social Media. ...is a question being asked of many this time of year. The answers range from serious to, well, delusional. First of all people take themselves too seriously when asked to respond to a question like this. Most will state the obvious in an attempt to sound bright. Few will have an original thought. Wait, I take that back, it's all original however shallow. Bottom line...there's only two kinds of forecast lucky and lousy! Matters not whether your the CEO or the Receptionist. Don't believe me? Do you foresee the 08-09 free fall? Proactive or reactive? If you were really good your model would be lean, flexible and agile. .........that's the advice I give to people less experienced at public speaking or presentations. Over the years I've had the opportunity to give presentations to groups large and small. I'm always looking to improve content and my delivery. I've concluded that the more successful presentations are the result of preparation (content) and a mind set (delivery). As people begin to fill the room I walk around and engage the audience. It gives me a sense of whose in attendance and it also allows me to be at ease further demonstrating to the audience that I'm approachable. ......an excuse. A crutch if you will. I was speaking with a colleague the other day. She recently lead a brainstorming session. The group was exploring ways to increase business in 2010 and they weren't allowed to mention the state of the economy. Think about it. Regardless of the economy you still have to conduct business. When things were going well did you really pay attention to the economy? Probably not. So why pay attention to it now? It's like the jobless rate. It's irrelevant. The challenge is to satisfy your clients needs. Now there's a word, emotion. We've all experienced emotion. Fear, hate, excitement, sorrow and exhilaration for a few. What about Passion? Yes, you've experienced that as well. It tends to ebb and flow. It's the stuff that keeps you going when you think you can't. You summon it to overcome, seemingly, the impossible. Passion leads confidence. Confidence feeds achievement and success. Stay passionate.........you may be surprised how far you roll. ....."clearinghouse" effect. Creating community requires one to become the "go to guy/gal" within that community......that notion of expertise = value. It's about "creating content"......key word creating. Original thought not shared commentary. You'll go more places, do more things and elevate your game if you create. .....such was the backdrop on the face of Macy's store during the annual Thanksgiving Day parade. With two small children, especially given the season, I'm constantly reminded to BELIEVE. Each evening I listen intently as my girls share and debate the existence of Santa and does Rudolph really fly??? Funny stuff after a challenging day at the office. As a small business owner, regardless of the economic climate, you'll be continually challenged. Amazingly, and at times with wonderment, you'll revel in your uncanny ability to conquer (win). Should you falter (lose), you'll pick yourself up and eventually win. Concluding that you never gave up on the task (dream). ........the easy part. Content, communication and collaboration require the heavy lifting. There's always a better way of doing things, ALWAYS! In my corporate career I was always all to willing to criticize, because it was easy, but more importantly offer several alternatives. All of which were up for discussion including criticism, skepticism and applause! The most notable outcome was meaningful discussion and , if you will, brain storming. .....not! Sorry to disappoint. In my teaser I refer to myself using the term EXPERT. Success is an interesting elixir. Successful I've been. An abject failure for sure. A student of the sublime making sure never to take myself too seriously. Wise I wish to be, however, I feel as though wisdom escapes me. All the while, apparently, wisdom comes to others more easily. About all things I'm passionate. Without passion life would be far less interesting. Success is the culmination of manythoughts, words and deeds. It is a continuum, a work in process, a trial and tribulation. Not for the weak or faint of heart but for those willing to persevere and see it to fruition. A business starts as an idea. We've all been there. Many years ago I began running. Long before it was popular and in a most peculiar place. The flight deck of an aircraft carrier off the coast of Vietnam. After a long grueling day of work on the flight deck I would change and begin my up and down....some 900+ feet, from stem to stern, in either direction dodging aircraft being placed for the next day's missions. I continued, to this day, to run daily in civilian life. In 1976 Bill Rogers and Frank Shorter brought home the Olympic gold & silver. In 1977 the NYC was going to break the confines of Central Park and run through the five boroughs of New York. Shorter, Rogers and most Olympians were to run the inaugural event. As I watched them run I was inspired to join them. However, the odds were against me. Unlike them, I'm 6 ft 3 inches tall and weigh 203 lbs. hardly made to go the distance. However, beginning in 1977, and for seven consecutive years, I ran and completed the NYC Marathon. Over the years there were many many races used as training runs in addition to a daily regime. Gladwell, in Outliers, is correct as it relates to repetition and the miles upon miles will attest to this. I was at the beginning of the running boom. I had an idea, vision and youthful enthusiasm. I was a participant and could relate to my brethren. From a business perspective I was quite inexperienced. I researched franchises but the stumbling block was money. I didn't have it and didn't know where or how to get it. Oh, how times have changed. ........simple. Not complex, complicated or complex. The view from 30,000 feet, more often than not, obscures the view from the ground. As a leader be keenly aware of micro managing........all too often that's you're problem. Especially tough for an entrepreneur! We, you and I collectively, tend to over think, over react and simply miss the point. ....the following was my second post in April of 2005. "New to blogging it's easy to see the value of this medium. Blogging, like the Internet, is changing the way we do business. For those, like me, whose business is service related there won't be a need for a website. The blog is much more powerful, much more user friendly and less expensive in the long term. The immediacy of the medium is a very strong attribute. On the downside blogging requires a commitment of resources, mainly time, and regularity in order to remain relevant. Long live the BLOG." How far we've come......so the question, Is Social Media a fad or does this horse have legs? In a recent session Giovanni Gallucci, the Social Media Expert, explained just how quickly <A class=zem_slink title=Facebook href="http://facebook.com/" rel=homepage>Facebook</A> was populated. Even more surprising were the numbers and how quickly Twitter was becoming a household name. Nothing new here, the tools have changed the game for everyone. Businesses, large and small, will continue to increase spending and participation in Social Media. There is no choice. What other way can you effectively and efficiently influenceyour community (aka customers)? Writing a business plan for a start up or maybe just doing a SWOT assessment you'll like to find out how you stack up to the competitio. At first it may appear to be a bit overwhelming but it's not. Soon you'll be comfortable with gathering said info and actually find it somewhat exciting. The easiest and most obvious,way, of course, is using Google. Whether it's adword search, analytics or websites simply type in what you're looking for and let the fun begin. As an example, yesterday I visited a competitors website. These days everyone has a website, no? In any event, as I went through the pages I was able to able to get information about their vendors. Not to mention their list of clients proudly displayed bbehind the tab "CLIENTS"! A few weeks ago I visited another site and was able to figure out how to reach one of their clients. An email and a couple of days later that potential client was in my office. At the very least I was able to get information and perhaps a new client as well. In addition to using the usual tools another effective approach is simply to ask. Call, visit or contact a competitor and develop a relationship. You'd be surprised how welcoming some folks will be. Heck, when I opened my doors here in Arizona several of my competitors brought work to me just so they could see my operation. Too funny. So you've got the internet and all ya gotta do is ask! Doesn't get any better than that. ...running a business is just that an art. The organization is made up of many movingparts. Whether you're by yourself or your a captain of industry there's a plan that is executed and adjusted as feedback comes in. Liken it to a real life chess game where thinking and cunning are as required as if you were confronting an opponent across the table. Consider the global marketplace and the thought of it all can be overwhelming. While the big picture is relevant the only real concern should be a shorter vision as in right now. What are the tasks that have immediacy and what resources are available to achieve results. All the time thinking ahead. When asked about the number of employees I have I say, "I don't know until they show up each day. But how do you explain a Bachelor of Science in Management???? ...this morning I got excited! Not about going to work but at the realization that a decision I made was actually going to pan out. Yet again. A few weeks go I attended a conference and in the course of that conference I sat in on a panel discussion by industry leaders. They were questioned and offered opinion upon opinion. The best they offered was the obvious. Business is off and the response is cut expenses. We all know the quickest way to the bottom line is through people as in layoffs. No mention of proactive strategies just cut expenses! Conventional wisdom dictates that when the economy declines you need to be more proactive in all aspects of your business. I was looking for a game changer but something that complimented what I do. Many of my colleagues were turning to direct to garment digital printing. The barrier to entry was minimal so you can imagine how many folks went that way. Laser decorating had a higher barrier due to the cost of the equipment. However, as I suspected, it brought about an increase in embroidery and opened up new markets. The learning curve has been challenging but it appears as though we're headed in the right direction. While business was slowing, throughout 2008, no one could have seen what happened in early 2009. For all intents and purposes business came to a halt. As it turned out we were already in a recession but no one had the courage to mention that. It's clear that the economy is now moving in the right direction. So it was, this morning, when I realized that I had followed the conventional wisdom and put my business in a position to capture market share and prosper. 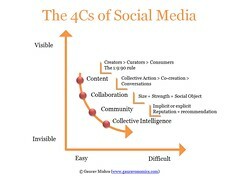 .......because Web 2.0, AKA Social Media, is rather challenging! As usual, when it comes to technology, most of you (you and me) feel challenged. As in the Pareto principle, 80-20%. For example 80% of sales comes from 20% of your clients. In the world of Social Media there is the 1:9:90 rule.... "The 1:9:90 rule states that 90% of all users are consumers, 9% of all users are curators and only 1% of the users are creators." You can do better than that! Get busy sharing your content, community, and collaboration! .......all the rage. "That was a line in an email I recently read. C'mon on you can do better than that! Social media is nothing until you engage and become participative. Imagine going to a networking function and standing there doing little in the way of interacting. 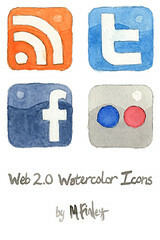 With Web 2.0 tools the game changes dramatically in many ways. ......said "in hindsight" as if to explain away a poor decision / outcome. It's tough to argue with hindsight being 20/20. Decision making is a process. We're confronted with a problem, an opportunity or some situation. We go about gathering information and then a process of discernment in the hopes of achieving the desired outcome. What's interesting about all of this is the psychology of it all. The way the decision is influenced along the way by our own preconceived ideas and idiosyncrasies. Multiply that by the number of individuals involved in the decision making process and you see where this is headed. Try as we may it is nearly impossible to maintain objectivity. In the end the decision you reach is tenuous at best. The outcome is predicated upon the commitment to the cause by the various stakeholders. Clarity of purpose and decisive execution will trump hindsight every time. I could never really get my arms around the idea that "the customer is always right." Many years ago an article appeared in the Harvard Business Review that spoke to this issue. The details escape me however I noted enough to lend legitimacy to my position on the subject. Many people give lip service to the relationship between merchant and customer. Some merchants bend way over, some bend mildly and there are those who feel entitled. The same can be said for customers. Their are those that work with you, some who tolerate you and then others who simply think "you should be so lucky to have my business!" There was a time when one might scoff at the idea of firing a customer. Sounds simple & straight forward but why don't more organizations sign on to this idea? Well, maybe they do. Productivity in this country has increased dramatically over the years. Doing more with fewer....is it any wonder that the unemployment rate has risen. It's not just the economy! Regardless of the discipline, within the organization, the processes to conduct business must be streamlined, lean. How many hands touch a work order, a PO or an invoice? .....being on the Board of Directors of a non-profit association. Reading between the lines make note that it's a volunteer position. I have the good fortune to serve on the Board of Directors for the Promotional Products Association International (PPAI). The Board is very well equipped to meet the challenges facing our profession. The economy, political agendas that could ban our participation in markets and the never ending challenge of providing members goods and services to name but a few. The association staff is unquestionably the BEST at what they do. Yesterday Seth Godin www.sethgodin.typepad.com blogged about non-profits and earlier this year he had a post about Guilds. From my perspective these were very compelling entries. Association management staff and BOD's work tirelessly to do good for the organization. However you can't please everybody. It's rather fulfilling when as a group we debate, challenge and agree to disagree. In the end speaking with one voice and committed to giving our best. It's difficult, in these challenging times, to convey the significance of accepting change. It's unacceptable to stand still yet I'm often surprised by those fighting to maintain the status quo. .......and the truth will set you free!!! C'mon we all know politicians play fast with the truth. Statistics lie and liars use statistics! Why should we be appalled at this type of behavior? This is what you elected to represent your interests at various levels of government. Notice I didn't use the word leadership. In government seniority equates to leadership and that right there is a recipe for failure! Would you run your company that way??? ...beginning to turn what have you been doing? OK, so maybe it's too early to call the recession over. However it's a matter of half full versus half empty no? I want to follow th "U" school of thought as opposed to the "W"." W "makes alot of folks nervous for many reasons. As a business owner what have you been doing? Have you used this opportunity wisely? Have you employed your scarce resources effectively? Have you developed new strategies perhaps looking toward acquisition to bolster revenue? How does your future look today as opposed to late 2008 early 2009? The forecasts for 2010 are flat and many would agree long term recovery will take years. It's still early enough in the business cycle to take advantage of sound strategies across your business. community. My oldest daughter started fourth grade a few weks ago in a new school. Olivia is a smart kid unfortuantely she has a rare genetic disorder. The public school, excelling at teaching despite Arizona's lack of funding, is just that, public. As parents we decided to enroll her at a catholic school. There was some adjusting to the new setting but it looks like our decision is beginning to pay off. The other night my wife went to the orientation and upon her return home shared the information with me. In our conversation she repeatedly used the word community. The schools philosophy is to engage the school's community. Not simply the student but the student's family as well. COMMUNITY. Hilary Clinton called it a village. Call it what you will. Just recognize the power of doing business with like minded people. Understand and excel in understanding the dynamics, become known as an expert providing creative solutions and be visible. .......are you actually doing via your website? Are websites a requirement ? It would make sense if you're selling a commodity and you simply want to control costs. Websites don't make sense if you're looking for client engagement and participation. The days of casting a wide net, in terms of marketing, should be over. Doubling your efforts with the status quo does not work. Think about this......Can you be as effective in your marketing efforts by simply having a blog, a permission based e-mail effort, a YouTube channel and a twitter account? I don't know what you're spending on marketing your website etc. but blogs, email, youtube & tweets are far less expensive and much more effective. .....has leveled the playing field for small business owners. Heck, it's changed the way we do business! Large business small business it's a new day. A problem for most start ups and small business owners revolves around the use of scarce resources. For many it's the ultimate investment...in themselves. Additionally, for me, it was the the ultimate final exam....combining the academic & the empirical (ie; experience). 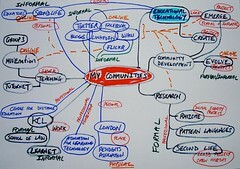 Facebook, Twitter, Ningo and bebo are just a few of the sites that allow us to assemble communities, tribes, a following. Add to this a little technology, such as a Flip video, and now you're doing marketing on a grass roots level. On the cheap. Very effective, very targeted with your message. Fleet of foot, flexible and or guerilla comes to mind. Delivering the message with little or no staff...efficient / effective use of scarce resources and.......some excitement! Walter Cronkite set the standard for his profession perhaps more so for mankind. Many of us grew up sharing our homes with him as he delivered the news. With keen insight, compelling compassion and upon occasion emotionally. He was, in some ways, our rock. Through the many recollections of presidents, colleagues and friends two things struck me. All agreed, unequivocally, that Mr. Cronkite was a man of integrity. Indeed integrity was a guiding principle. Secondly, was his opposition to the Vietnam conflict. That a man of his stature in those trying times would have the courage of his convictions is remarkable. A remarkable man indeed..........not soon to be forgotten. .....would want to read anything I wrote". If I hadn't been sitting on the floor that comment, by Guy Kawasaki, in a recent webinar would have floored me! So it was refreshing to hear a legend, if you will, articulate what I fear most as I contemplate blogging. What is it that I say could possibly interest someone to read my blog and how am I to build a following? There was a time in my life when I kept a journal. Much like seeing a professional keeping a journal allows one to collect their thoughts and deal with things. As a small business owner I don't have a staff to help in putting forward ideas and action plans etc.......so blogging, at times, is cathartic. So, hopefully, the inspiration to continue comes from people like Guy or perhaps from the comment I received to a post a few weeks ago....."don't stop blogging, good logic, good exercise=good business"
.......that I do product endorsements. After all who am I and what difference would my nod do? However, there comes a time.....to make it in the blogsphere takes building a lot of "relationships" if you will.......that's an integral part of business....has been since Jesus was a corporal.....the medium changes but the message is always the same. Seth Godin, because he is who is, is able to radically change the approach...SAMBA ( www.sixmonthmba.com )is compelling...... now why can't academia grasp this concept? "stay on the offensive and celebrate the small victories"
.........upon us. It's Friday afternoon my staff has left and I'll follow shortly. It was a good week. NOT to jinx things but from my vantage it would appear as though there is an "up tick" in activity. For the past several weeks established clients have been increasing their order volume and the order size is shifting to higher quantities. There's excitement all around. Challenges too as we try to meet increased demand with a smaller staff. Small victories abound as well. Over the past several weeks I've been able to "pick up" several new clients that represent rather significant potential. As usual the result of effective "word of mouth" campaigning. Marketing is fun. Don't be so serious have some fun with creativity! .......take yourself too seriously ? "Lots of people take selves too seriously" says business icon Harvey Mackay (www.harveymackay.com) in this mornings newspaper. An amusingly quick read finished with Mackay's Moral: "Anyone who thinks he or she is indispensible should stick their finger in a bowl of water and notice the hole it leaves when they pull it out." The economy, the drab news about the economy, all the pundits (political, economic gurus, the comics)...does it get any better than this??? Can't neglect Rush, Beck, Hannity et al. all desirous of the pundit label but lo relegated to simple entertainer status. ENOUGH already......let's get this thing moving......my colleagues, small business owners, around the country will rise to the call as they always do. Realizing that they are the underpinnings of this economy of ours. All we ask is that Leaders lead or get out of the way. Believe in the courage of your convictions and leave the spin where it belongs. The sad fallout from the current crisis is that the political system has finally been exposed......as the camera panned the house during Mr. Obama's speech we saw the faces of too many politicians who have expressly or by defacto contributed to the current state of the nation. This truly is a Bi-Partisan crisis.......too many have served too long!!!! Thanks for your service however it's time for a career change. In an earlier post I shared with you the story of my wife and her biological father, Joe Eszterhas. Wondering all along whether creative ability can be "imprinted" in DNA ? well they are about to embark on a "project" as coauthors of a book, written separately, about their lives. My wife's writings tend to be powerful and compelling so I'm looking forward to the final product. ..so I've stolen more than just a few moments! Have you ever realized just how busy life is? Some weeks ago I noticed that several business magazines were exploring the idea of entrepreneurial talent /spirit. Is it real or imagined. Is it, much like instinct, innate or can it be learned. I tend to think that we all have ideas / dreams. Ideas for a better mouse trap, of striking out on our own in search of a better life. In the early 70's, long before the running craze took hold, I was an avid runner. At the time there was very little attention given to the sport. There was little in the way of shoes, clothes and dietary info. As the sport continued to gain in popularity demand for products increased. At the time I thought it would be a great idea to open a store, a running shoe store, that would serve the growing demand. However, given my less then sophisticated business savvy, at the the time, I didn't know anything about starting a business, securing capital etc. Of course that all changed in 1989 when I started my present company. The difference of course was experience. Eleven years after graduating from college I gave myself the ultimate final exam. Starting a business. From the outset the business was, and to this day remains, profitable. So I guess I passed! Can you teach someone to be an entrepreneur? Of course you can. Will they be successful? That's a different question. and what would you do differently? 89.7 was my preliminary score as a result of a presentation given at the 2006 PPAI (Promotional Products association International) Show. While the folks at PPAI were excited about the outcome of the show, increased attendance and education that was over the top, they were concerned about those who fell below the 90 % mark. They questioned those of us who may be interested in presenting next year yet fell below 90%..."What would you do differently in an effort to improve?" For starters I thought don't give me a session at 7:30 a.m.! Give those times to the guys/gals who are making the BIG bucks. If they're that good let them warm up the crowd. Time heals all..........I looked over the scores of all the presenters and came to realize that of those who scored into the nineties were really PROS. They are the talking heads. Professional speakers and educators whose income (real or imagined) is directly related to the participant's evaluations. SALESMAN lest I sully the reputation of those who value their craft. Their are those who can and then there are those that.............speak. The irony of this is that these guys have to be able to effectively market themselves in order to get the gigs. Content, however, is a completely different requirement. Criticize if you will, I had not given a presentation since the PPAI Show last year. I didn't rehearse this year's presentation until moments before the appointed time. 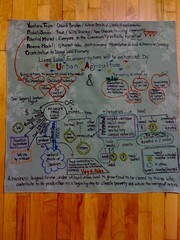 However, I was comfortable in my more than casual knowledge of the topic......EMBROIDERY. The presentation was to cover the technical nature of the discipline covering soup to nuts in 1 and one half hours...at 0730 hours (7:30 A.M.)!!!! I did an admirable job and felt as though the objectives were achieved. So, proudly, I'll take the 89.7 knowing, of course, that there's room for improvement. More importantly though my primary role, in business, is to maximize profits, keep my employees gainfully employed, and to see to it that my clientele is thoroughly satisfied by our commitment to quality and service. 89.7..........all things being equal that was pretty damn good! Afterall, I have a business to run. Fear........a state of apprehension. I remember when I began to formalize my plans for starting this business. Fear was certainly something to reconcile. The fear of failure, the fear of disappointing those who had faith in me and of course the skeptics. But I must say that my self confidence was never in question nor was my cautious nature. For me life is the challenge. Life is terribly simple, so too business, however once we set things in play it can get fairly tricky. Events and interactions conspire, innocently enough, to make things ever so interesting. It comes at you much like the water from a fire hose, fast and pressure packed! The challenge is not to handle all of it but what you must. Sift through the never ending current and muster the courage to recognize and resolve the meaningful. It's safe to say that some days you get the elevator and some days you get, well you know. Failure is not fatal, to the contrary. Tom Peter's, in Re-imagine, espouses the value in failure and I tend to agree with his point. It's not like you stayed awake and planned to fail. The value is in the postmortem assessment of the failure. What went wrong and most importantly what did you gain? This is my wife's doings.....you see my wife, LOVE OF MY LIFE that she is, has a blog http://specialneedsmom.com . First of all she has the genes for writing or should I ask the question: can writing be a genetic trait? Her biological father is Joe Eszterhas ,of Hollywood fame (Hollywood Animal, www.aaknopf.com). She's also a wonderful mother to our daughters, Olivia, and Zoe. Zoe has "specials needs" as the result of Mitochondrial disease. Mito what disease???? Long story BUT may be the cause of many afflictions. Another story another time, back to Suzanne. Quite often she and I check our blog stats and she's killing me, literally. Her numbers are quite good while mine are mediocre, ok, dismal!!! She is, however, encouraging. As we say in NJ: "Encourage This!". Bloggers, that you are, realize that it can be time consuming and challenging. To deliver exceptional content is taxing. You may have the creative juices flowing but it takes time to deliver..........and on top of that I run a small business..........throw in old and I'm ready for bed...............not really but you know what I mean. There is, however, inspiration....today I received an encouraging comment suggesting that my content was good and that I should link with more folks (I'm trying) through comments etc......certainly made my day. However the wife , 1200 visits and numerous comments, has left me in the dust or is it the blog blues? So hep me out.....link me, offer comments, hook me up! Alright then you've decided to take the plunge, you're going into business for yourself or maybe it's time to change your image. A crucial step in either situation is to find a name for your business. 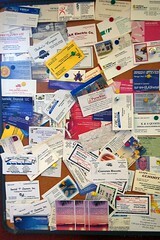 Now keep in mind that, as the head marketeer for your business, you want to capitalize on every contact that you make. At any given moment you must be ready to get people excited about who you are and what your company can do for them. Sounds easy enough but you'd be surprised. Naming rights and coming up with an appropriate logo can be more difficult then you realize. Simplicity is often overlooked in naming. Quite often our "vision" gets in the way. We come up with names that are sappy, confusing and downright wrong. Identify your "core" business while trying to be concise and to the point. For example Embroidery Unlimited tells a potential client exactly what we do. We do embroidery and our capabilities are unlimited. Just ask me and I'll tell you! So, as with all aspects of the business, keep it simple. Now coming up with a logo is equally as hard. Recently, at www.marketingprofs.com, there was a two part article explaining what makes logos effective. There is a psychological component to these efforts. You want to get your message out along with your contact info. For many years my logo was my typeset. However, as our production turnaround became a more effective marketing pitch I came up with the "con" / Bail me out logo (Download buscard.pdf) . There is a chance, however slim, that some will think I'm a bail bond guy but......in any event I think it plays into our hand. The idea is that EU, Inc. is the "go to guy" in any situation relative to embroidery and particularly in a time of real need. The initial contact witha prospective client, be it in person or otherwise, may be your only and best chance to impress them. Make sure your business name carries with it the message you want to send. Likewise the use of logos and tag lines. Be creative and haves some fun but remember everything you do sends a message. Usually when I embrace something, in this case blogging, I get very excited and want to share the excitement with who ever will listen. With much zeal, bordering evangelical, I've been explaining blogging and it's potential to several clients and colleagues. Their response is less then enthusiastic and they quite often reference the shortfall of the web etc. On the other hand my wife, the owner of a publishing company and aspiring novelist, has started her blog, specialneedsmom.com and the response has left me envious. Upon retrieving the office mail yesterday I felt a sense of vindication when I looked at the latest issue, May 2, of Business Week. The cover story was about Blogs et al. The story is well done and it is noteworthy that they have joined the sphere via http://blogspotting.net There can be no doubt that change is in the air. The possibilities and excitement are simply overwhelming. Imagine. I visited several blogs yesterday, among them, Emergencemarketing.com and Seth Godin's, there was talk about change. Also read the white paper by Cherkoff at www.changethis.com. It's true that most people don't like change however the more I reflect the more I come to understand the importance of change. The markets/clients we deal with aren't standing still so why are we (businesses) content to stand still? Seth's post today, Nouns and verbs, is a new twist on the old adage, "actions speak louder than words".........isn't it obvious that we need to embrace change? On the drive home last night I was gazing at the McDowell Mountains upon the side of which sits the neighborhood where I live. Traffic on the 101 was heavy with the usual mix of full and part time residents as well as the infamous snow birds. Looking forward to the weekend I began to listen to Water Colors (contemporary jazz) on XM radio. Acoustic Alchemy was performing live from B.B. King's in NYC. During an interview a band member told of his audition and subsequent hire. The line was very long and populated by many who looked alike with long hair and the fashion of the day. In addition to the guitars they carried they also brought amplifiers, some so large that they weren't able to enter the auditions. The fellow that made the cut was different, unlike the others. He mentioned that his head was shaved and since he could barely afford a good electric guitar he was unable to bring an amplifier. Of course his talent was superior as well. But the story got me thinking about business. More specifically, what is it that we do that makes us different? There are several basic core tenets that you need to recognize in business. To be different is simple, but time and again, takes courage. But without courage what's the point. To be different requires casting a critical eye upon all that you do. Keeping in mind that EVERYTHING you do sends a message. As business owners we look for any competitive advantage we can find. Most often however it's as simple as being different. In my business I make it a practice to be different from the competition. They in turn, through their own weaknesses, are my best advertisers. Recently I did a phone interview with a fellow writing about word of mouth advertising. He was surprised that for 16 years my company had succeeded, for the most part, by using only WOM. Nothing more then the single line in the Yellow pages, no print ads, no other media ads. The mind set of the organization is along the lines of a war footing. In an effort to achieve success we have a war mentality. We are different because our organization is flat, decisions are made quickly, we live to serve and today is the only day that counts. This is very different from how the majority of businesses are run. It takes courage to be different, it's risky but as you know reward is commensurate with risk! Dare to be different, dare to be.........wasn't that an ARMY/Marine recruitment slogan??? For nigh sixteen years now I've been at the helm of a very successful small business. Call it what you will, right place right time, lucky or fortuitous it's been successful primarily as the result of "word of mouth" advertising. There was and is no formal marketing plan. The strategy has always been the same; quality and service. With a waning interest in the business and looking for some excitement I decided to embark on a Journey to discover Marketing and what impact it may have on the business. So, like many, I began the search on the Internet. To say there is a wealth of info available is an understatement. Suffice to say I found exactly what will work.......email marketing. It encapsulates, if executed correctly, everything you're looking for in a Marketing strategy..but there was a troubling statement in one reading. It is projected that some 31 billion emails are circulated daily with the average person receiving approximaetly 2200 per year. Given the SPAM debate/regulations and the countless thousands of marketing "incursions" we encounter isn't devising/executing an email strategy exciting? It's not a question of should one move in this direction but more a realization why have you waited so long. Marketing is simply about managing change. Trying to maintain and grow your customer base in the face of ever changing variables. Enlighten your customer base via simple and regular email based communications (ezines,blogs, podcasts, etc)........and have fun doing it.